‘Female offenders require a multidimensional gender specific approach that addresses the problems that form the context for women’s criminal behaviour’, advocated Ms Josephta Mukobe, Principal Secretary for the Kenyan State Department of Coordination of National Government, in an opening address, read on her behalf by the Director of Administration in the State Department, at the start of three days of training on women offenders and the UN Bangkok Rules for Kenyan probation and prison officials. Approximately 9% of the total Kenyan offending population are women, comparatively higher than the global average of 2-9% of national prison populations. In Kenya, around 3,027 women and girls are serving prison sentences and, while accurate data is lacking, it is estimated that another 2,000 are serving non-custodial sentences in the community at any one time, (between July 2014 and February 2015, 4,161 female offenders had undertaken and completed community service orders). In addition, many women are detained in pre-trial remand prisons, unable to afford bail or legal services. Approximately 312 children are currently accompanying their mothers in prison. 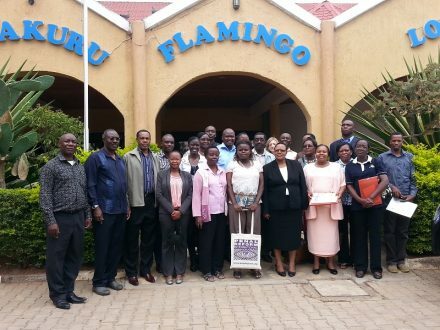 18 officers from the Kenyan Probation and After Care Service and two senior officials from the Prison Department participated in a three-day ‘training of trainers’ course, delivered by PRI, in Nakuru, Kenya, last week. The course covered the typical backgrounds of women offenders, their special needs, the UN Rules on the Treatment of Women Prisoners and Non-custodial Measures for Women Offenders (the ‘Bangkok Rules’), and how the Rules could be applied in Kenya. Participants discussed how women’s care-giving roles, poverty, domestic abuse and discrimination are often primary factors that lead them to offend and that these factors, as well as recognition of women’s characteristics and needs require a gender-sensitive approach for women offenders from pre-trial to their rehabilitation. The harmful impact of imprisonment on women, and their children and families, was recognised and the need to develop gender-sensitive non-custodial measures was highlighted. The Kenyan Government has already made progressive first steps towards a more sensitive and proportionate response to women offenders. Their Inter-Ministerial Special Needs Offenders Committee has identified women offenders as requiring special attention; the Probation Service has included implementation of the Bangkok Rules within their 2014/15 targets and have appointed a dedicated officer to lead on this. 10 officials have already completed PRI’s Bangkok Rules e-course. Participants in the Nakuru training pledged to become ‘champions’ on women offenders, training other officials, and working on adapting pre-sentence reports, prison and probation protocols and guidance, gender-sensitive community service placements and rehabilitation measures. The Director of the Probation Service, Mr. Jerim Oloo also called for research to be undertaken in Kenya to inform this work, recognising that very little data and good practice is known, not just in Kenya but globally, on gender-sensitive non-custodial measures. PRI will be supporting the Probation Service with this work.